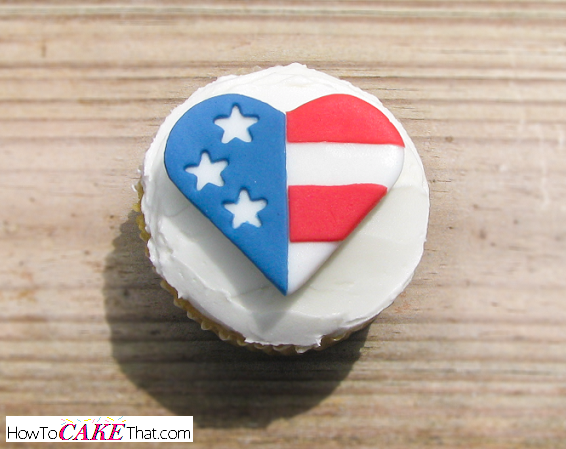 How adorable is this little heart-shaped American flag cupcake topper! This easy-to-make topper is the perfect decoration for your next batch of 4th of July cupcakes or for any other patriotic holiday or event! This topper can be made of fondant, gum paste, or modeling chocolate. 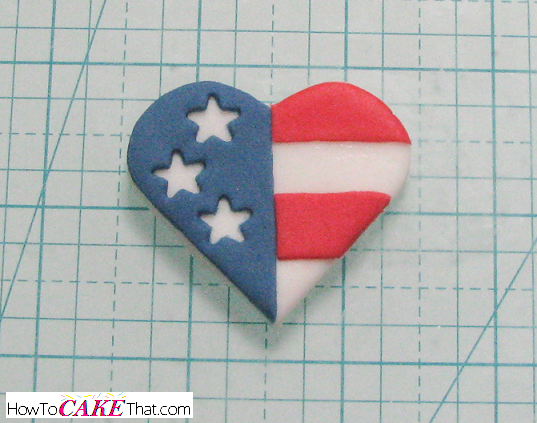 If making this topper from fondant or gum paste, allow one or more days for drying time. If making this topper from modeling chocolate, be sure to keep decorations cool or they will melt. 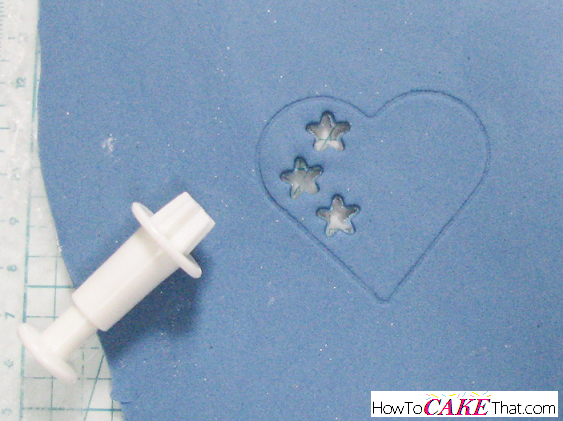 For this tutorial I am using white fondant mixed with a little Tylose powder (Tylose helps dry the fondant). To begin, dust work space generously with cornstarch. 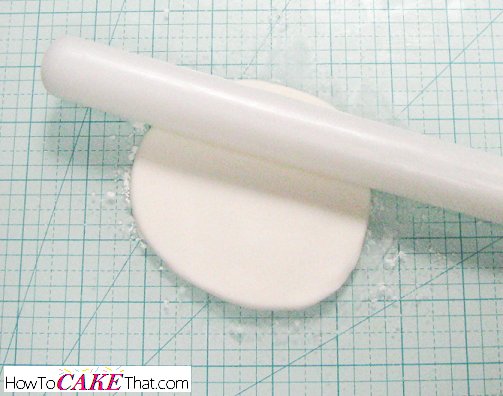 Next, roll out white fondant about 1/8 of an inch thick to ensure the topper will be sturdy. 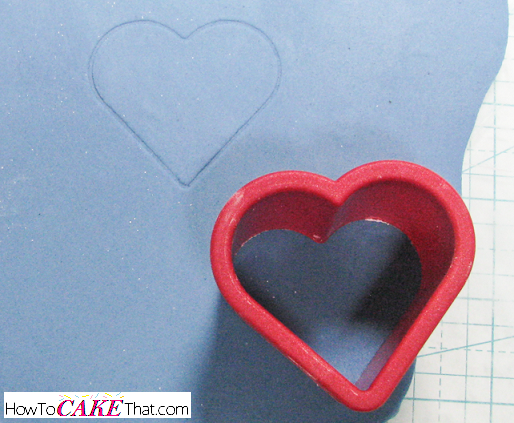 Next, use a heart cutter in a size suitable for your cupcakes, and cut out as many white hearts as needed. Next, color some of your fondant navy blue and roll out as thin as you can get it. 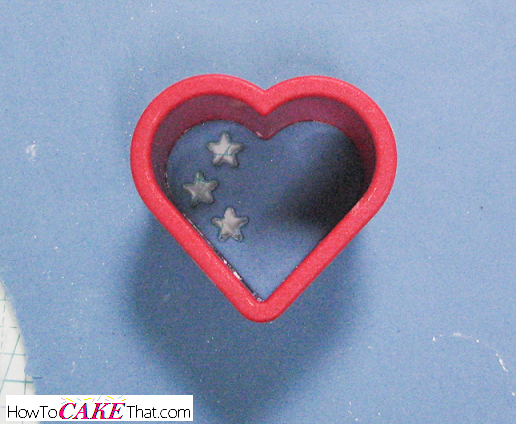 Then, using your heart cutter (same size as for the white), gently press into the blue fondant to leave an indentation. Do not cut all the way through. Using the heart indentation as a guide, imagine a line going down the center of the heart dividing the heart in half. 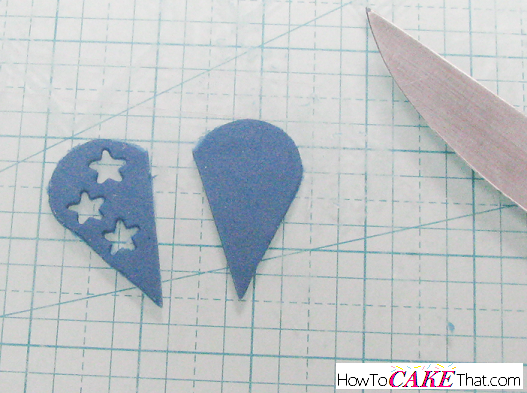 On the left side of that line, use a small star cutter to cut out a few small stars. Note: The reason the heart is not cut out before this step is because the star cutter will stretch the blue heart making it larger than our white background heart. Now it's time to cut out the blue layer. Line up your heart cutter over the original heart indentation and cut all the way through. 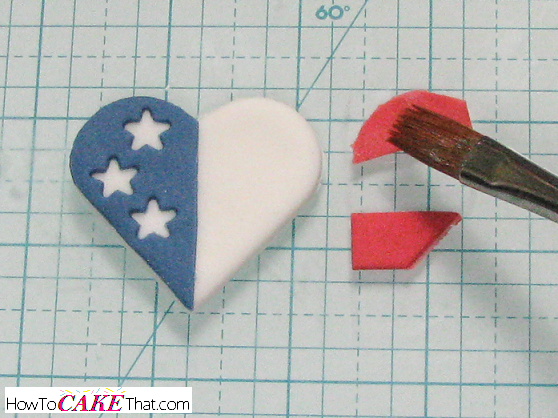 Using a sharp knife, cut down the center of the blue heart. Now it's time to glue the blue layer to the white background. 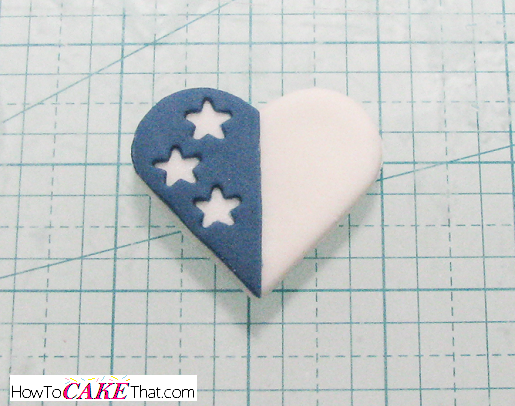 To do this, lightly dampen the back of the blue piece of fondant by brushing it with water. Carefully lay the blue layer over the white heart. Try not to move the blue layer once it has been placed on the white heart or the blue food coloring may stain the white heart. 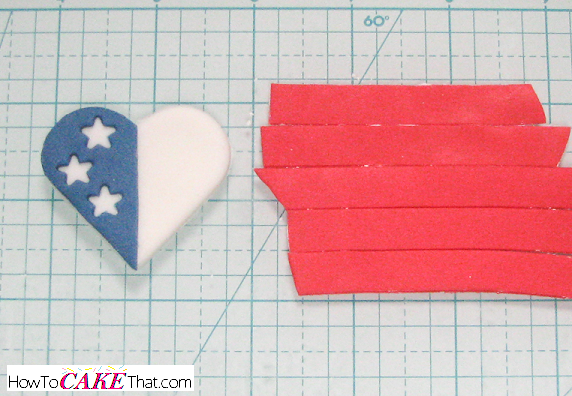 To make the red stripes, color some fondant red with gel color. Roll the red fondant out as thin as you can get it. 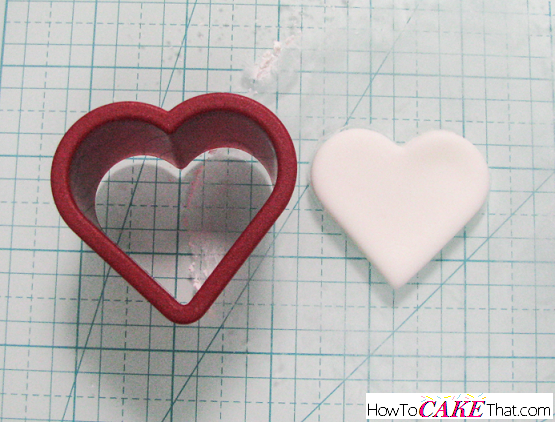 Using a ribbon cutter or a sharp knife, cut even strips of fondant. Line the strips side by side until they are the same size or slightly larger than your heart topper. Next, using the heart cutter, ensure the strips run perfectly horizontal through the heart. Then cut the strips with the heart cutter. Using a sharp knife, cut down the center of the red heart. Remove left half of the heart. On the right half, remove every other red strip. 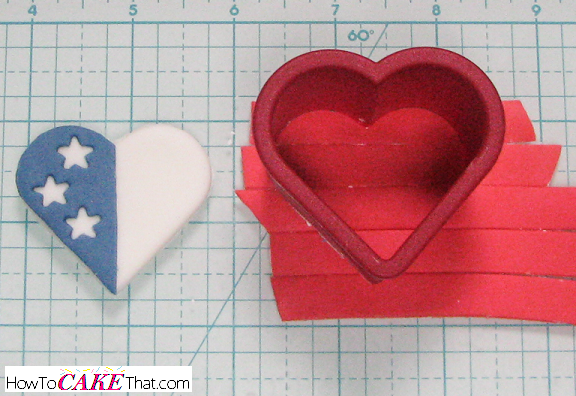 On the remaining red strips, brush the back sides with a tiny bit of water to glue them to the white heart. Be sure not to use too much water or move the red pieces once they've been placed or the red coloring my stain the white heart. 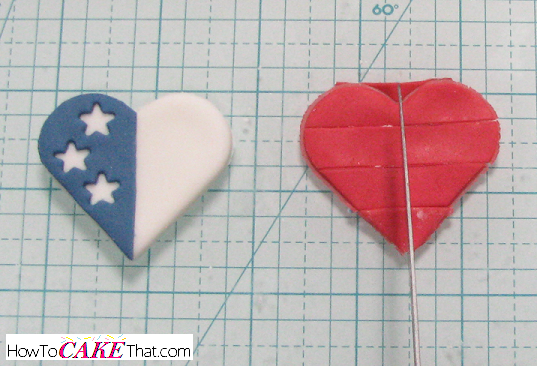 Place the red stripes on the heart and let the topper dry for one or more days until hardened. 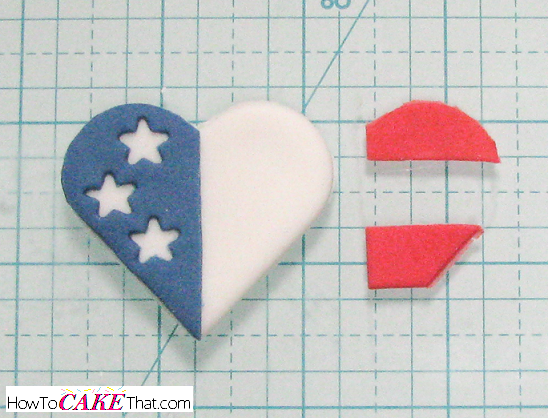 And that's how you make this super cute patriotic cupcake topper! I hope you have enjoyed this tutorial! God bless!